NOTES: Resin body multimedia kit. I mentioned earlier that one of the three major 1/43 multimedia car kit makers was Starter. This is very much typical of their work in that they have a resin body and interior/pan. There are pips on the resin pieces where the mold bits have been cut away. Air bubbles are present, but mostly on the lower part of the body. These are easily filled and are normal for these kits. There was one air bubble on the top of the driver's seat. This one is a bit different as it has some very nicely done wire wheels in metal/p.e. already assembled. It has metal for the gas cap on the back and head light bezels. The head lights are in resin. Tires are a rubber or vinyl and still fairly soft. There are a pair of body screws an d a plastic steering wheel. No gear shift lever, but easy enough to make from a straight pin or section of wire. There is also a single vacuform windows piece. Not shown is a piece of brass tubing for the axles. It will need to be cut. In line with other cars I bought from this same vendor, there are no instructions. Now I know that with racing cars from other lines I've had instructions so I'm not sure if they are supposed to come with them or not. It actually doesn't matter all that much as the parts count is relatively low and assembly should be pretty easy, but it would be nice to have anyway. What is included is a decal sheet with two racing options and a set of placement instructions. Not sure how viable the decals are, but at least there are some I can use for tests. One of the markings options is a car that does not have vent wings. The kit includes them so the body will need some modification to properly duplicate this vehicle if that option is chosen. I should also mention that the vacuform windows have started to yellow a bit, but that should not be all that much of an issue. A majority of the work involved in building these kits is cleaning up the resin parts. The first thing one wants to do is to take care of the pinholes. These were filled with superglue, followed by sanding and additional applications as needed. One has to be quite careful during the sanding process not to open up other pinholes. Once that was done the rest of the mold seams were dealt with. 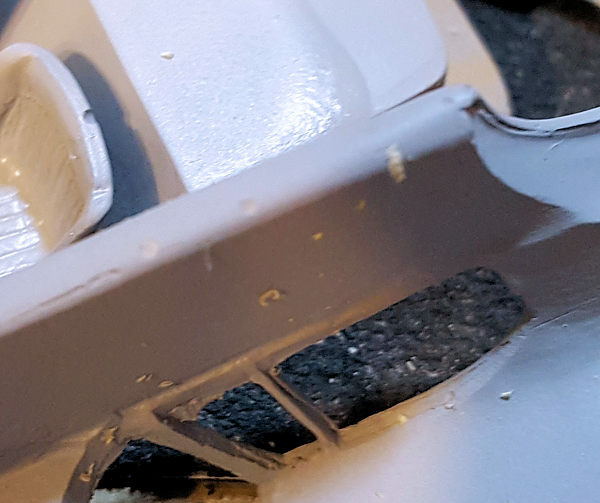 It is often difficult to see them all in tan resin, so a primer coat of grey was sprayed on them, and sure enough, it was obvious what had been missed so another round was completed before yet another coat of primer was added. I used Tamiya's fine grey for this. You can see from the image where I needed to focus my attention after the first primer coat was applied. Often these areas can be best found by simply running a finger over the surface to feel the depressions and such. I removed the vent wings as I was planning on doing the racer. One of the possible issues here is that the interior is not a stripped out race car interior, but I felt that in 1960 when this one raced, a relatively stock interior was required by the rules. Perhaps not, but I'm sticking with that! Once that was done, the interior was given a spray of matte black and the body a coat of Tamiya TS-17 gloss aluminum. Naturally, the aluminum shows every tiny fault so I had a little more work to do. Meanwhile, I put together the wheel and tire combinations. Note that there are two different widths for both of these, so they appear the same. They are not. The rubber tires were properly pliable, but I did have one short shot tire (as in a big divot in it). I also took this opportunity to check the viability of the decals by trying one of the markings I'd not be using. It worked well, but was just a teaser as when I got ready to apply the blue racing stripes, the first I tried broke up. Well, that pretty well meant I had to paint this one and did so using Model Master French Blue. Naturally, the stripe is crooked, which is why I dislike painting stripes. While that was drying, I sprayed a semi-matte clear into the interior and cut the tubing to length for the axles. I also had to drill out the rear axle holes a bit to get these to fit. The rear axle was then glued in p lace with super glue. Back at the body, I started applying decals. Something I've noticed using Microscale decal film is that it tends to make the decals curl. I'm not sure why that is the case, but every one I used exhibited this trait. It was overcome by a light application of Mr. Mark Softer. I started with the roundels and when dry put the numbers and other logos onto the body. This was all sealed in with a coat of Testors clear lacquer from a spray can. After the steering wheel was painted and installed (mounting hole needed drilled out), I cut sections of tubing for the axles. The rear piece of tubing was glued into the lower pan after enlarging the holes in the pan for it so it would actually fit. The two rear wheels were then glued in place. These are actually quite loose so those not wanting wobbly wheels will have to glue the hubs. Of course, if that is done, the wheels won't roll. Front wheels were glued to the tubing and set aside. This assembly will fit into the body piece. The acetate had the side windows removed and the rest glued to the inside of the body with super glue. I then glued in the front wheel assembly and screwed the body pan to the body. Unfortunately, it seems the pan was warped as one wheel was considerably in the air. I removed the pan, pried out the front wheel assembly and used a round file to make the axle more level. This seemed to do the trick so the pan was reattached. Not done yet. Headlight bezels were glued in, followed by the resin head lights. I also installed the driving lights. They just did not look right so I painted them with chrome paint. The kit comes with no exhaust and the dual pipes on each side of the rear are quite prominent. I used some .058 inch stainless steel tubing for these. These were simply cut out and glued to the pan. Not the same length and nothing is attached to them, but few will be turning the car over and it looks better. I then painted the brake lights, turn signals and the grille. That was it. Total build time on this was under a week, much of the time spent cleaning up the parts and doing the few fiddly bits. 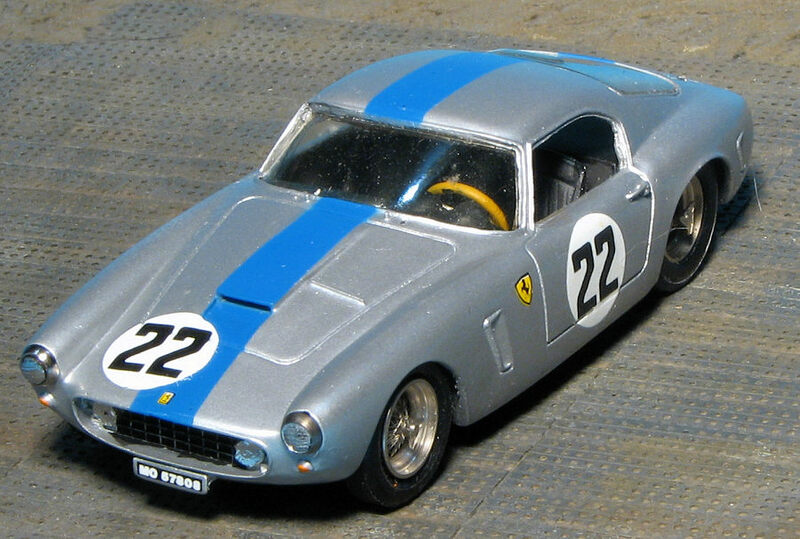 The result is a very nice model car that fits into my collection of small scale racers. It is a pretty trouble-free build and one that I'd have no trouble recommending to anyone who wants to have a go at a multi-media kit.